Who doesn’t love a good mount? Let’s face it, horses are a huge part of the fantasy genre. They were the main mode of transportation in medieval times and the knights and cowboys we loved as kids rode them. But for all their lore and presence, mounts have some problems in D&D. Of course the dungeons aspect of Dungeons and Dragons can make mounts a little impractical. I can remember numerous times a player sadly sighed as the party entered a dungeon, his PC leaving a horse, a host of mounted combat feats, and equipment behind for the umpteenth time. In order to make mounts useful we need to think beyond dungeons. Exploration Age is a massive world. Countries are 3,000 miles wide or more. Also, it’s dangerous out there! Mounts are the cheapest way to get from place to place and to avoid danger. After all, I’ve heard tell that famous Shakespearean kings would have handed over their titles in exchange for horses when their lives were in danger. In D&D Next a horse is twice as fast as a person. That means getting to places in half the time. Plus horses can wear swifty horseshoes. When these magic shoes are paired with a speedy cobblestone road they move three times as fast as they normally do so six times faster than a regular pedestrian. Awesome! So there’s one way to appreciate your mount beyond jousting. For more on speedy cobblestones, check out this earlier post on travel in Exploration Age. Even at those speeds it still takes a significant amount of time to cross a country and even more so to cross a continent. That’s loads of time getting to know your mount and tons of possibilities for mounted encounters while traveling. Imagine traveling at breakneck speeds down a speedy cobblestone road as bandits riding horses with swifty horseshoes give chase. It’s a medieval car chase worthy of James Bond or Vin Diesel. In cases like this a mount is essential. Exploration Age also has the potential for large-scale combat, where horses give everyone a big speed advantage. There are plenty of countries with rocky relationships and militant organizations with large memberships and a bone to pick. Massive battles are practically inevitable in an Exploration Age campaign. When PCs are able to do circles around enemy battalions, they’ll be glad they brought their mounts. But finally, and most importantly, Exploration Age is about exploring. Whether you’re riding over the frozen ocean of the North Pole on a dogsled, exploring the depths of Verda’s Sprawling Jungle on the back of a yak, or riding a lizard through The Underdark, mounts make travel faster and can serve as pack animals for carrying all the loot you’ve won. Not to mention when you’re heading off the road certain mounts in Exploration age ignore difficult terrain. More on that below. Remember that time we road pterodactyls? There’s another issue with mounts – horses can be kind of boring for some folks, or sometimes horses don’t perfectly fit a character concept when another mount might. 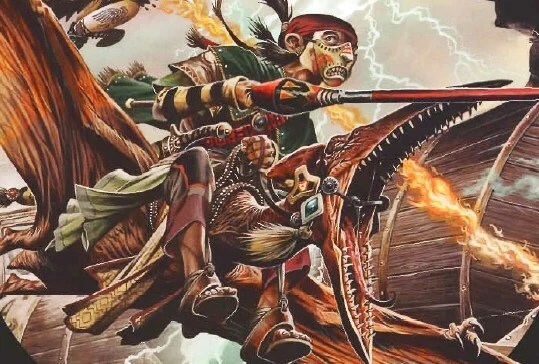 I know there are plenty of options in D&D aside from the horse and pony, but many of these mounts, such as griffons, pegasi, and nightmares, are hard to come by and harder to train and control… and rightfully so! These mounts give players ridiculous advantages like flight, insane speed, and special attacks. They are at least an awesome magic item and at most another PC in the party. That’s all well and good at higher levels, but what about unique mounts for the low-level adventurer? (Riding dog being the adorable exception and Dark Sun’s kank being the wonderfully weird exception). Well this solution is pretty simple. Exploration Age adds a whole host of normal and bizarre mounts to your game. Many of these mounts are affordable and easy to find for low-level characters because they don’t have powerful attacks and special abilities. They help add flavor to the world and add to the feel of playing a fantasy, tabletop role-play game. Still, each mount needs to feel a little different from the rest mechanically. A riding lizard should be able to do some stuff a horse can’t, especially if it isn’t as fast. Well in Exploration Age there’s a lot of different types of difficult terrain on the map. There are snowfields, mountains, forest, jungle, swamps, and more. I decided if a mount was native to a type of terrain, for instance the lizard in the swamp, then it would ignore any difficult terrain of that type. Take a look at the mounts available in this excerpt from the Exploration Age Campaign Guide. Exploration Age is home to some bizarre and wonderful animals that serve as mounts beyond horses and camels. Many can cross certain types of difficult terrain at normal speed. Use the charts and descriptions below to help you look at some interesting creatures for sale. Note: These are common mounts for sale, other fantastic mounts might be found and trained at the GMs whim. Descriptions are provided for the creatures which do not exist in the real world. Riding Lizard These over-sized monitor lizards are trained to carry a rider across swamps, marshes, and jungles. While they may not be as fast as a horse, they can tolerate the humid conditions and wet terrain better than most other mounts. Riding Deer These over-sized white-tailed deer were first bred by elves to be large enough to hold a rider. They spring through wooded forests and hills with ease, making it easy to get across huge swaths of terrain. Mountain Ram Huge goats large enough to hold a man were first trained by the Bragonian dwarves. Now they are the prefered method of travel for all who traverse mountainous peaks. Dogsled and Team A team of 8 dogs comes with a sled, ready to pull a rider and gear across the frozen landscapes of Canus. Riding Turtle These enormous, freshwater turtles are large enough to hold one rider on the shell. Outside water they only have a speed of 20 feet per round, but in water they are quite fast. Turtles like this are often used in lieu of boats when traveling on lakes and rivers. Ornithopter This is a special one-person flying machine created by Bragonay’s artisans for reconnaissance and solo travel. It has huge flapping wings powered by the rider which allow for lift and propulsion. An ornithopter can glide great distances. The speedy cobblestones in the roads of Findalay and Parian allow for travel at double speed when paired with swifty equipment. The Arcane College sells this equipment, advertising it not only as fast and convenient, but also as safe, since with swifty gear one is three times as fast as any monsters or bandits (theoretically… a few bandits have acquired their own swifty gear). Small gems along the wheels and on the bottoms of the shoes and boots harness the magic of the cobblestones. When using swifty equipment on a road of speedy cobblestones, magic energy hums and crackles with blue sparks when the gear connects with the stones. I hope you’re as excited about this stuff as I am. I’ve never really had my players use mounts with any frequency and I’m hoping my Exploration Age game will be different. Mounts can add some great characters and relationships to the game. Think of famous rider/mount pairs. Gandalf and Shadowfax, Eragon and Saphira, the Lone Ranger and Silver – the list goes on. Even if my players don’t reach that level of companionship with their mounts, these animals have a purpose and the PCs have options. That’s never a bad thing.